The A20 is one of the most affordable recumbent bikes from Schwinn. Its frame construction and feature range are similar to the Universal R20 model. It’s a bike designed for home use, offering a lighter capacity than the Schwinn 230 and 270 models. This exercise bike has been around for more than five years, but over this period of time, it has received several improvements. For reference, the Schwinn A20 that we are addressing here is the 100329 version. The Schwinn A20 has a slightly different construction than most other recumbent bikes. It reminds more of the construction of a rowing machine. Its main longitudinal bar which serves as adjustment rail for the seat attaches to the front section which holds the drive and resistance elements. This bar, as well as the seat assembly, is rated for a user weight capacity of 275 lbs (125 kg). Due to this construction, the bike does not offer a step-through possibility, like the Exerpeutic 1000, for example. This being said, entry and exit may be a bit difficult for users with certain disabilities. Needless to say, the main frame components are made of steel. They’re also coated with a corrosion-resistant paint finish. The color used for this A20 version is black. Previous versions were gray or white. The fully assembled unit has a fairly large footprint, especially lengthwise. It is approx. 61″ (155 cm) long, and 19″ (47 cm) wide. This width refers to the stabilizers, though. The widest point of the unit is given by the handlebar assembly, which is approx. 25″ (63 cm). Therefore, Schwinn recommends a usage area for it of 100″L x 58″W (254 x 147 cm) or at least one foot of clearance on each side. The bike is not extremely heavy, though. With its frame fully set up, it only weighs approx. 67 lbs (~30 kg). This weight, plus your own weight delivers a lot of stability. Plus, the rear base features polygonal stabilizers which offer better leveling possibilities. Although this exercise bike isn’t extremely heavy, its front base is equipped with transport rollers. These facilitate the relocation of the unit once you have finished your workout. 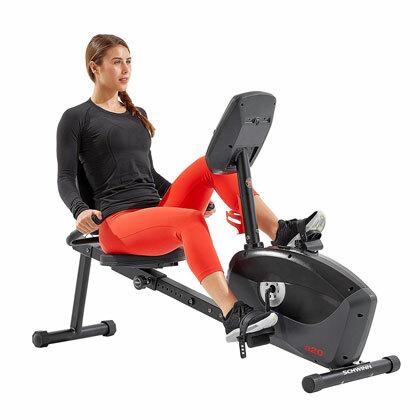 However, as opposed to rowing machines that feature a similar frame construction, the frame of the Schwinn A20 does not fold, nor it can be stored vertically. The Schwinn A20 is equipped with an ergonomic seat. Its bottom section is approx. 16″ (40 cm) wide, while the backrest is approx. 17″ (43 cm) high, but a few inches narrower than the seat. Both the backrest and the seat feature a thick layer of foam padding, and a durable vinyl upholstery which is also sweatproof. The rail of the seat features 12 adjustment notches with a distance between them of approx. 1″ (2.5 cm). This being said, the bike can accommodate comfortably users between 4’10” and 6’2″ (147 – 188 cm), promoting a complete leg extension. Taller users should still be able to use this bike with no problem, but they may not benefit from a full leg stretch. The backrest itself does not offer any adjustability. It does not recline, nor you can adjust its height as for the Diamondback 910SR. 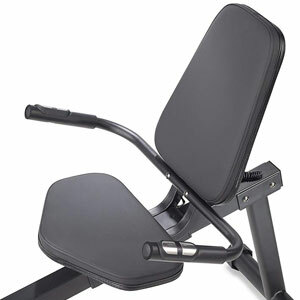 It is directly attached to the two seat frame bars, and provides a very firm and secure lumbar support. The seat’s adjustment system involves a turn knob placed under the seat on the right side. This being said, adjusting the seat position while you are seated may be a bit difficult than for bikes with a lever-based seat adjustment system. But nonetheless, adjusting the seat takes only a few seconds. 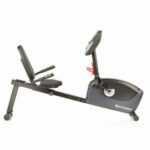 This Schwinn exercise bike only has a set of handlebars, which are attached directly to the seat assembly. They feature rubberized grips for optimal comfort and hand adherence. They also integrate stainless steel contact sensors. So, by holding on to them, the console can monitor your pulse. 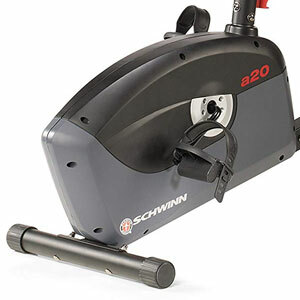 The Schwinn A20 features an automatic eddy current resistance system. It incorporates a magnetic brake and a servo motor. This being said, the resistance can only be adjusted from the console. When you select a certain tension level from the console, the motor will change the intensity of the magnets’ pull on the flywheel, which results in a higher or lower pedaling difficulty. Evidently, since the resistance adjustment is automatic, the bike needs a power source. The console can be powered by 4 D-type batteries (which are not included), or an optional AC adapter rated 120V 60 Hz Input, and 9VDC 500 mA Output. The bike offers 8 levels of resistance. The lower level delivers very little pedaling difficulty, which can be a great choice for users with certain disabilities. Conversely, the 8th tension level offers enough pedaling difficulty to enable you to break a sweat quickly, benefit from a more intense workout for the legs, and burn more calories. The bike’s internal flywheel is perimeter-weighted. This design delivers a higher inertia and a very steady pace. Its exact weight is not specified. However, considering the overall weight of the bike, its weight probably does not exceed 20 lbs (9.0 kg). The flywheel is bi-directional. Therefore, you can also pedal in reverse. When pedaling in reverse, the resistance remains unchanged, given by the selected level. Most exercise bikes that have an eddy current resistance system use a belt transmission; the A20 does not make an exception. It integrates a durable rubber belt which delivers a very smooth and quiet motion. Also, as opposed to a bike chain drive, it does not need any lubrication. The bike is equipped with a durable crankset, featuring solid steel crank arms. The pedals have a weighted design; their weight elements enable them to always turn face-up when you remove your feet from them. They have adjustable straps so you can secure your feet on them if necessary. 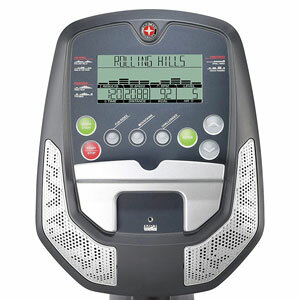 This Schwinn exercise bike is equipped with a programmable console. It has a fairly wide LCD display which shows 8 important readings, including time, distance, kcalories, pulse, the selected resistance level, RPM, speed, and final results. Also, its top section shows the grid of the selected workout program. For distance and speed, you can select either English or metric units. For the time metric, you can select a goal so the unit will countdown from the selected goal value to zero during your workout. For pulse reading, you have to hold on to the integrated contact sensors. The unit is not telemetric, and cannot read your pulse via a Polar or any other type of HR transmitter. Although this exercise bike does not have Bluetooth connectivity, nor it is compatible with any online fitness apps, its console provides 7 workout programs to keep you motivated. The Quick Start programs (or the Manual mode) allows you to freely adjust the resistance as you pedal. The other 6 programs are preset and assigned to three categories. These are Fun Rides (Rolling Hills, Ride in the Park), Mountains (Pikes Peak, Pyramids), Challenges (Uphill Finish, Cross-Training). Each program category has its own button on the console. Each workout program has its own specifics. For each program, you can set up the desired duration. Also, during each program, the bike will auto-adjust the resistance, according to the current workout segment. The console also offers two extra, non-fitness features. One is the sound system, the other is the tablet holder. The sound system consists of two speakers integrated into the bottom corners of the console unit. There is an audio jack input in the middle of the console, where you can connect your smartphone, tablet, or MP3 player. A connection cable is not supplied though, and this port does not act as a charger for your device. The tablet holder is placed below the main controls of the console. It can accommodate any tablet. However, a larger tablet placed on it will cover the controls and the console display. The drive and resistance elements of the bike come already assembled, and attached to the front part of the frame. However, there still are several parts that need assembly. You will have to connect the main seat rail to the front frame part, attach the two base stabilizers, the seat, the backrest, the handlebars, the pedals, the front mast, and the console. This may take more than an hour. The included manual provides very clear assembly instruction, though. Plus, a basic toolkit is included. The bike’s maintenance doesn’t require much. Since it uses a belt transmission, internal lubrication is not necessary. Basically, all you have to do is periodically check for loose bolts and parts, and re-tighten them. 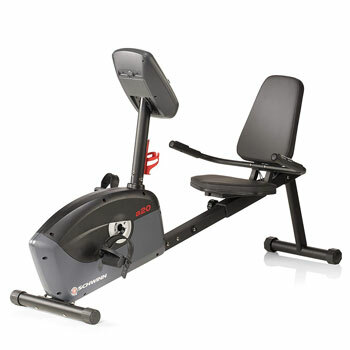 The Schwinn A20 is a recumbent exercise bike designed for home use. It’s equipped with an eddy current resistance system and has a console with 6 preset programs. It features an ergonomic seat which offers plenty of adjustment for a wide range of users. It’s a great bike for light to medium intensity cardio workouts, intervals, muscle toning, and weight loss. And finally, it’s an affordable trainer, offering an excellent price/quality ratio.